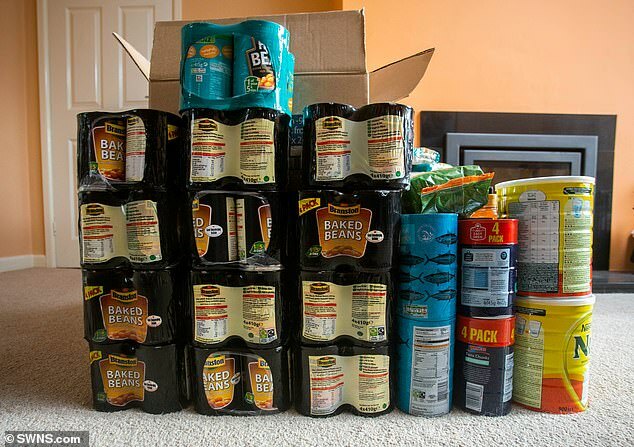 A family is stockpiling everything from baked beans and Marmite to quinoa and couscous in case of a no deal Brexit. 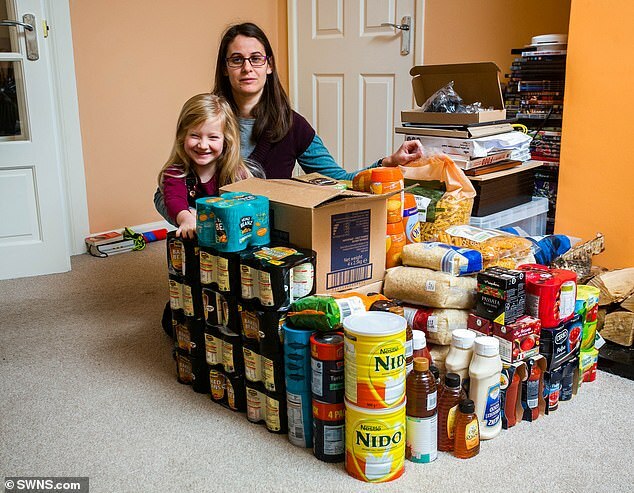 Nevine Mann, 36, and her husband Richard, 37, claim they have enough 'essentials' to keep them going for four months after the UK leaves the European Union in March next year. 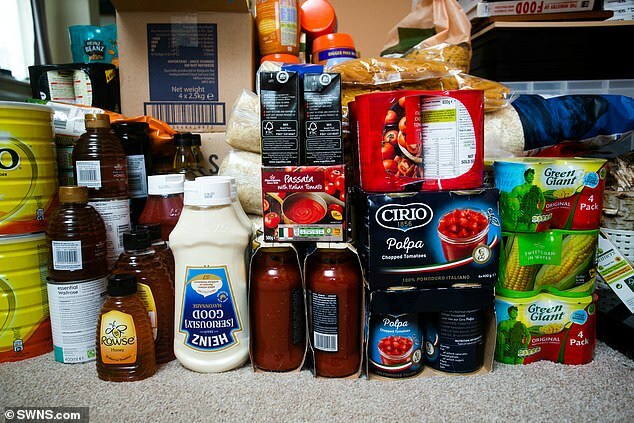 The couple, of Illogan, Cornwall, have stockpiled chickpeas, kidney beans, tuna, pasta, rice, couscous, chopped tomatoes, sterilised milk, tinned corn, beans, paracetamol and ibuprofen. 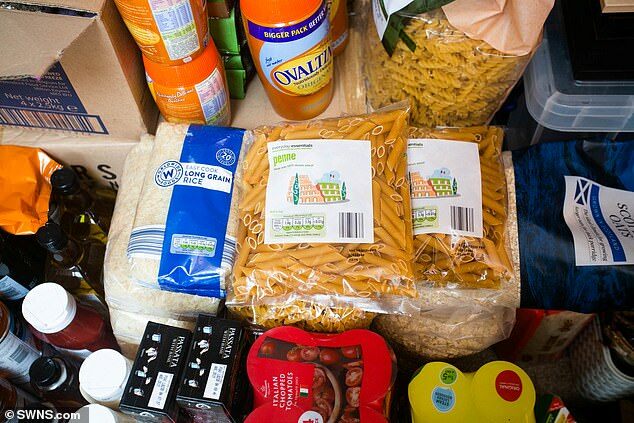 They have also bought mountains of aspirin, juice, hand soap, Calpol, dried milk, honey, tea, coffee, porridge oats, raisins, bread, flour, yeast and Marmite. The pair, who have three children, started buying extras on their weekly shopping trip when the Brexit negotiations began. Mrs Mann, a former midwife who voted to remain in the EU, said: 'A little while ago we were aware that Brexit was in the offing, and it seemed like there would be issues with securing a deal. 'The results of a no deal Brexit would be catastrophic in terms of getting supplies in the country, certainly in the short term. We started buying extra of things we would usually buy. The Manns, who have three children, Oliver, 18, Ethan, 13 and Paige, five, have been doing their shopping at the local Sainsbury's, Tesco and Aldi in preparation for what might happen when the UK officially leaves the EU in March. Their cupboards are already stocked with 52 tins of beans, 16 cans of tuna, large tubs of mayonnaise, eight cans of chopped tomatoes and four packets of passata. 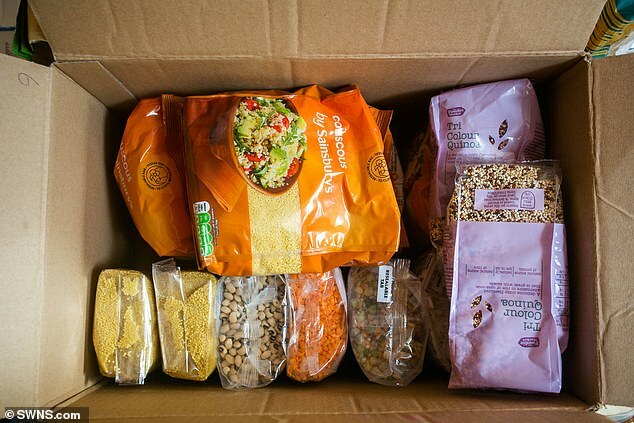 There are also two large tubs of milk powder, several large bags of rice, pasta, tri-colour quinoa and couscous. 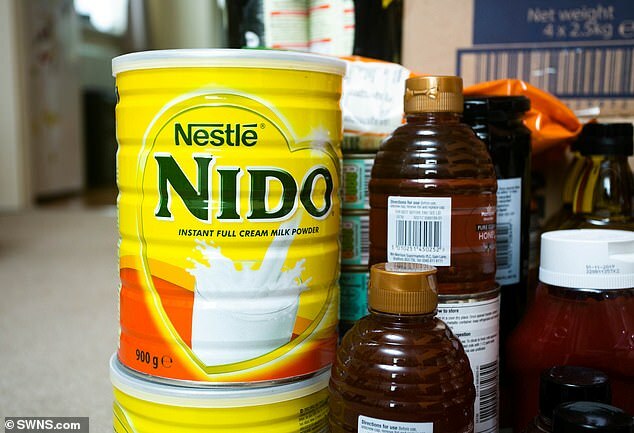 Mrs Mann, who home schools her children children, added: 'There are a few things we wouldn't usually buy, like sources of vegetarian protein and powdered milk. 'We've got baked beans, chickpeas, couscous, pasta - we've got things like tea, coffee, Ovaltine, things like that. 'We also bought Marmite so we can have some flavour. We're basically there now so we will slow down now. 'We're not going over the top, we've got enough to get us through the first couple of months if there is no deal. 'We're planting seeds in the garden and we've got extra to plant in spring. 'No deal Brexit is looking more and more likely, we're waiting to see if the new deal goes through or not. 'If that doesn't go through it will be no deal because there won't be enough time to sort another one out. 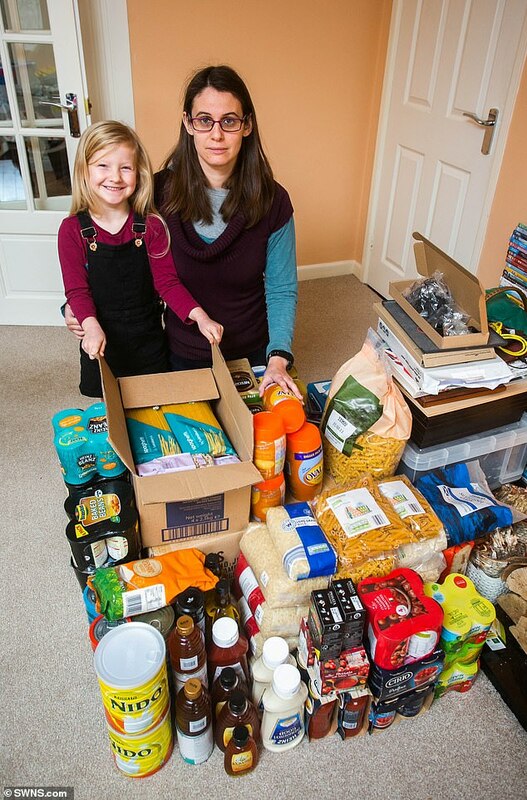 The couple have been buying more dried food, medication, pet food and are even stockpiling renewable energy. Their expanded shopping list also includes seeds so they can grow their own food in the garden and equipment to purify rainwater. 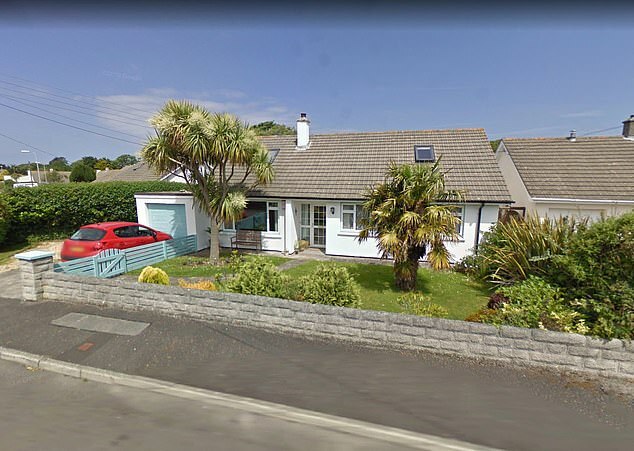 The Manns also have solar panels on the roof and a 290-gallon water tank because they fear power could also be in short supply once Britain exits the EU. Mrs Man said she was also stockpiling her own medication, because she takes anti-epilepsy and blood-thinning drugs. Theresa May had her EU withdrawal agreement signed off by the 27 country leaders on Sunday in Brussels. She now faces the daunting task of getting the 585-page document approved by the 650 MPs in the House of Commons. The final vote is currently scheduled for mid-December.